Rapidly expanding AAH, one of Australia’s leading hire equipment companies, has opened a shiny new purpose-built facility in Crestmead, about 32 km south of Brisbane. As part of the celebration, AAH, which launched in Sydney in 2006, has taken ownership of a brand-new Genie® ZX®-135/70 articulating boom lift, which is expected to attract plenty of capital city construction and maintenance work. In addition to opening our new branch in Perth in January 2017, the new Crestmead facility is a response to AAH’s aggressive growth strategy, explains Pat Italiano, Chief Executive Officer, AAH. Pat adds, “The new lean facility enables us to support our 500+ strong fleet in Brisbane more efficiently and to make sure we’re able to service the city’s strong construction sector. Strategically, the Crestmead facility is in a booming industrial hub close to the M3. “This location is logistically very good for our business in Queensland. In keeping with AAH’s geographic coverage, Pat believes he’s never seen the construction sector looking healthier nationally. Pat adds, “Construction is usually cyclical. Traditionally, 2-3 states or territories are firing, while the rest have less construction activity. However, now every capital city seems to be going well and the forecast for the coming years looks very positive for our industry. Genie equipment represents around 70% of the AAH fleet ranging from Genie® GR™-15 vertical masts to the super Genie SX™-180 boom lift. Pat is pleased with the addition of the Genie ZX®-135/70 articulating boom lift to the expanding AAH fleet. “The attraction for us of the Genie ZX-135/70 model is the mini XChassis™ axle system. This allows our customers to use the machine in tighter applications,” explains Pat. Furthermore, the operating speed of the Genie ZX-135/70 boom is an improvement on the previous model. As for working with Genie, Pat contends: “There’s a high market acceptance for Genie, which enables us to win more business and to support our existing customers. 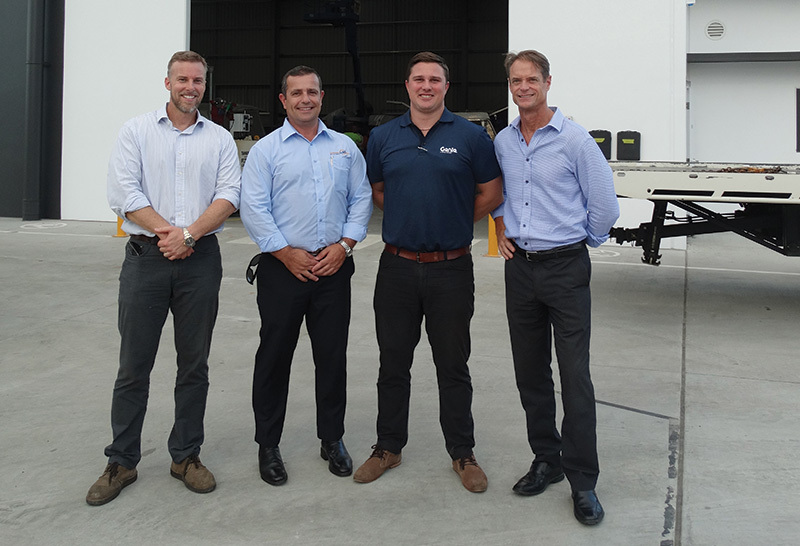 Below left to right: Stuart Bennett, Owner of AAH; Pat Italiano, CEO of AAH; Mike Podziewski, Genie Northern NSW Regional Manager, Terex AWP; Brad Lawrence, Genie General Manager, Terex AWP.